I am sharing this post in partnership with the Iowa Pork Producers Association. As always, all opinions are 100 percent my own. Thank you for the continued support of brands I work with, making it possible for me to continue creating quality content for you. Grilling a quick and easy meal has never been so easy. These tender and Juicy Grilled Pork Chops with Spicy Peach Glaze come together quickly for a dinner your family and friends will not soon forget. The glaze can be put together in minutes, while the pork chops undergo a quick brine. Get this easy meal in your dinner rotation now! As a little kid, I ate a lot of pork chops. And when I say a lot of pork chops, I really mean it. At least twice a week. Honestly, I didn’t mind it in the least, in fact I looked forward to it. My mom prepared them one of two ways. How many of you remember Shake ‘n Bake? Does that still exist? Shake n’ Bake Pork Chops was one of the ways my mom got dinner on the table quickly. Pour the seasoning in a bag that was provided and coat the pork by shaking it in the bag and baking. It didn’t get easier than that technique. My mom also made her pork chops by broiling them in the oven. Again, it was nothing fancy, seasoned with salt and pepper. Both methods were decent, solid meals and are very reminiscent of how people cooked in the 1970’s and eighties. I can’t complain since I still love pork chops to the max! However, while both of the previously mentioned pork dishes were good, they do not compare to these Juicy Grilled Pork Chops with Spicy Peach Glaze. 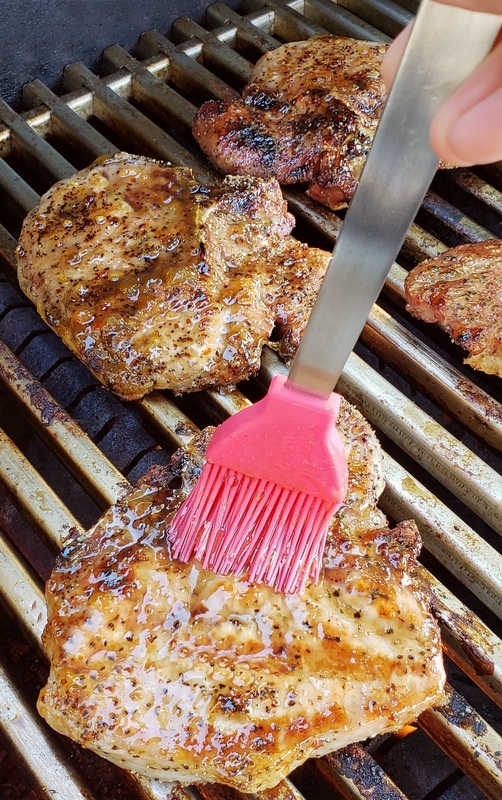 If tender and delicious pork chops made with ease on your outdoor or indoor grill is for you, then I’ve got you covered. 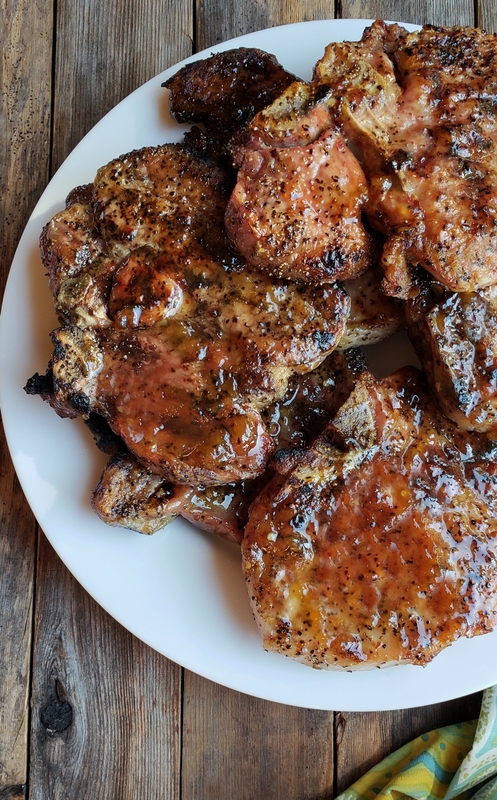 While they are perfect for summertime on the deck, you can easily make these chops for tailgating and any other occasion you might deem appropriate. The absolute best process for keeping pork chops tender and juicy comes down to two things, brining and cooking to the proper temperature. More on the latter later, for now let’s talk about brining. Brining is not just for the thanksgiving turkey, the process works on all kinds of meat. In short and without getting too scientific, brining works its magic by breaking down muscle tissue, which draws in moisture through a process called osmosis. And while it might take two days to brine a turkey, a small cut of meat like a pork chop benefits greatly with a thirty-minute brine by greatly improving the flavor and tenderness. And while the chops are brining you have enough time to put together the spicy peach glaze and heat up your grill. I had never thought about brining a pork chop until I visited Iowa a couple years ago on a farm trip to learn firsthand how pigs were raised. Not only did I indulge in the most amazing brined pork chop in Iowa, but I also discovered that one third of the pork raised in the United States comes from Iowa too. When any of us purchase pork from grocery stores across the United States, you are supporting family farms in Iowa and across the U.S. It’s a good thing. I left Iowa with a clear understanding of common production practices when it comes to raising pork. I even got to help deliver a few pig babies during my time on the farm. It was a magical experience riddled with the personal touches and warmth one can expect to find in a farming community. I can only hope to return someday to continue my education when it comes to pork production. 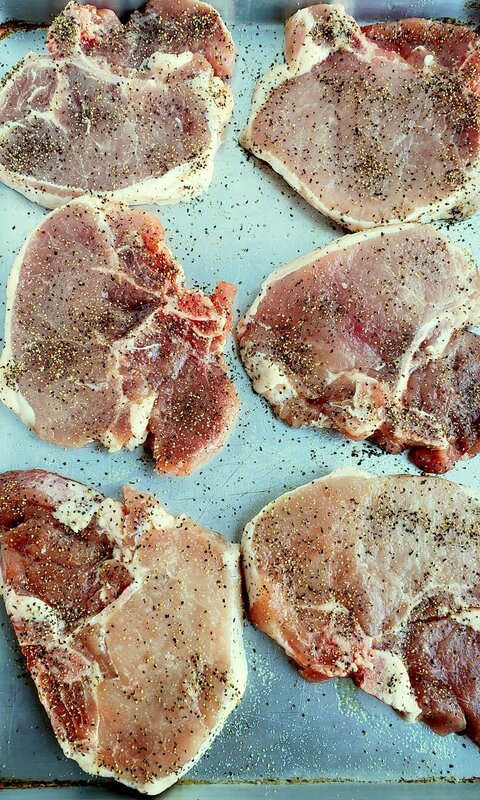 After the brining process I pat the pork chops dry and sprinkle them generously with coarse ground pepper. The spicy peach glaze comes together in minutes. 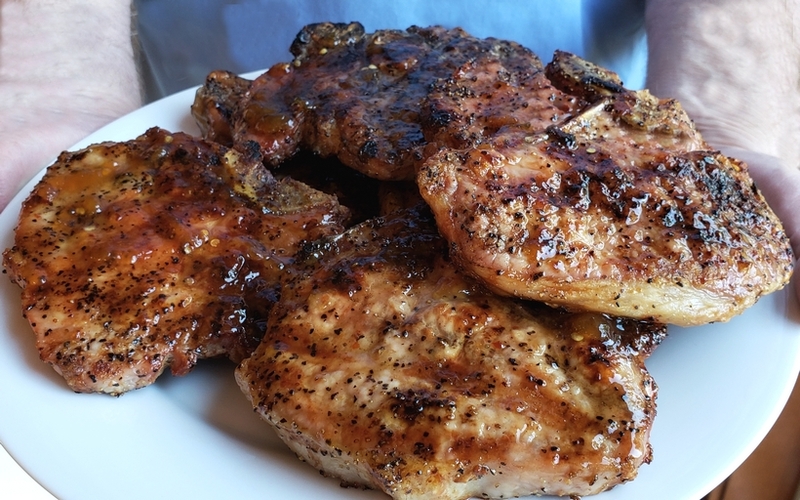 Since it is made with peach jam, it can made year-round whether you grill your pork chops indoors or out. 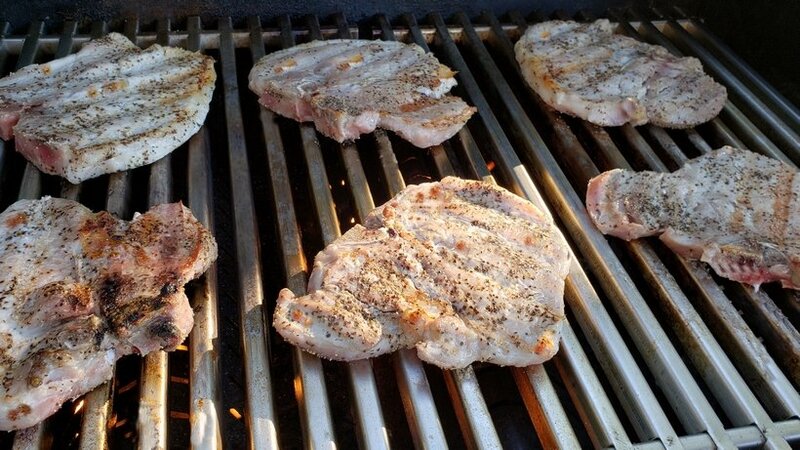 I place my pork chops on the grill over very low heat and turn and rotate them every five minutes. This is what they look like after the first turn. After about fifteen to twenty minutes the pork chops are beginning to brown and it’s time to check their internal temperature. 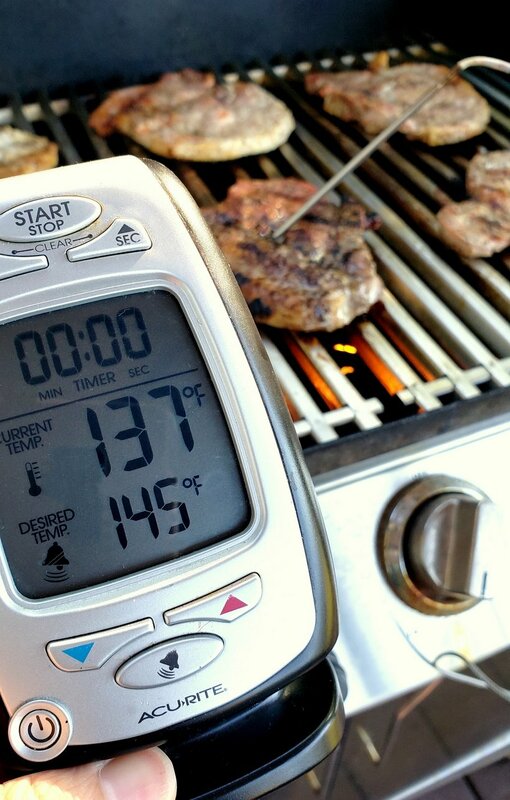 I use my favorite digital thermometer to check the internal temperature of my pork. The safe internal cooking temperature for fresh cuts of pork is 145 degrees F. Use a digital cooking thermometer to measure the temperature at the thickest part of the cut, making sure to not touch any bone. Once you have reached 145 degrees F, remove the pork from the heat and let is rest for three minutes. The pork chops will have a blush of pink when you cut into them. I begin glazing my pork chops when they are about ten degrees (135 degrees F) below doneness. If you try to glaze sooner, you will end up burning the outside of the meat. It doesn’t get more delicious than this. Everyone will be salivating when you arrive at the table with a platter of these pork chops in tow! If you’re looking for more delicious pork recipes, consider making my Gingery Pork Ramen, Slow Cooker Thai Pulled Pork or my favorite Pork Tenderloin with Blueberry-Bacon Barbecue Sauce. When fall hits make sure this Pork Tenderloin with Honey Mustard Sauce is on the menu along with these Spicy Curried Pork and Rice Bowls. You won’t be disappointed with any of these choices! In a container large enough to hold your meat, dissolve the salt in water. Add pork chops. If there’s not enough liquid to cover, add a solution of 1 cup of water and 1 Tablespoon of salt until the pork chops are completely submerged. Let sit for at least 30 minutes and up until 2 hours. Meanwhile (right before grilling), make the glaze. Add wine, jam, jalapeno and red pepper flakes to a small saucepan over low-medium heat. Bring to a boil and simmer until reduced by half and the mixture is thick and syrupy. Remove from heat and stir in butter. Set aside. Remove pork chops from the brining solution and pat dry. Season each side with coarse ground black pepper. When chops reach an internal temperature of at least 135 degrees F, begin brushing the glaze on each side of the pork chop. 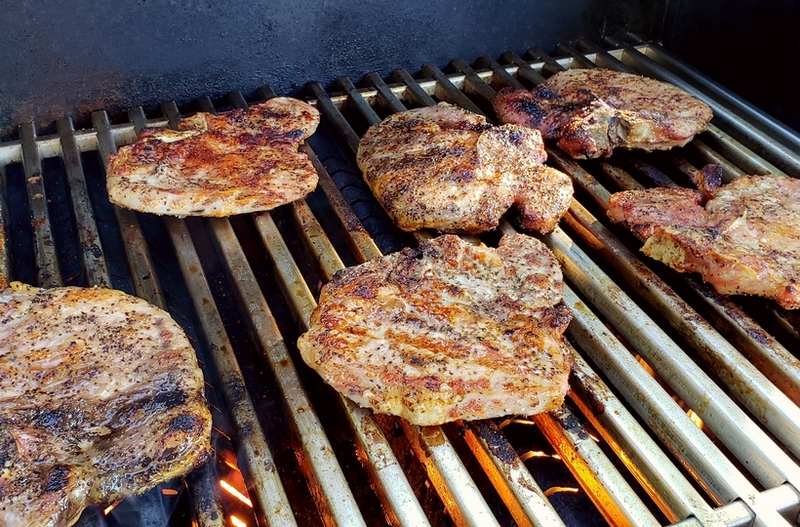 Continue grilling the pork chops until they reach the desired temperature of 145 degrees F. To check doneness properly, use a digital cooking thermometer to measure the temperature at the thickest part of the cut without touching any bone. Once you have reached the desired internal temperature of 145 degrees F, remove them from heat and let the pork chops rest for three minutes. I never considered brining to make my pork chops juicier! What a great idea. This is happening tomorrow for Sunday dinner. Yes, it really does help with tenderness. Enjoy. 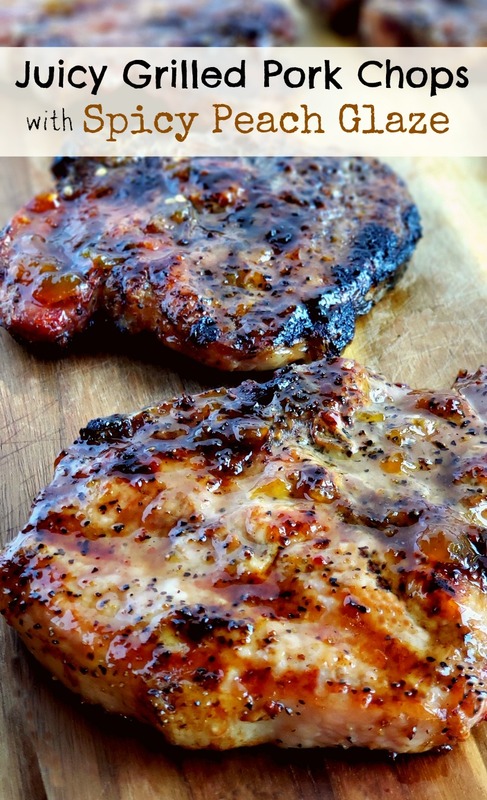 I love the idea of a spicy peach glaze on some juicy chops! Summer in every bite. Agreed! Best taste of summer right here. Oh my Cathy – these chops look divine! That glaze must be fantastic. Thanks for sharing this recipe – I will make it soon! Yes, that glaze is everything! I’ve never brined before. Do you refrigerate the pork and brine.mixture? Since they only need to be brined for 30 minutes, you do not. Such a deliciously brilliant way to make pork chops, with the grilled flavor and that sweet glaze! Pork and peaches are a match made in heaven! I really would like this on my dinner table tonight- will have to settle for tomorrow night. What a perfect summer grilling recipe! 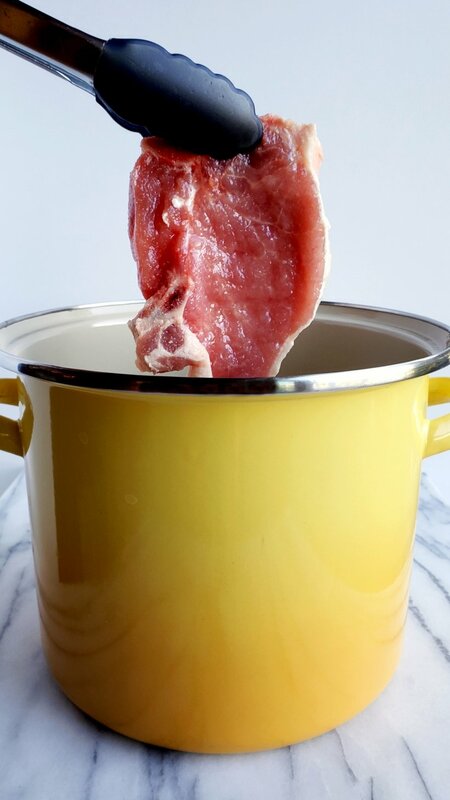 Do you rinse your chops after taking out of brine…then pat dry? Are they too salty if you don’t rinse? I’ll be trying this recipe this weekend..thanks so much! I do not rinse them.